The Russian Security Council is to discuss the issue of internet security in emergency situations. The Kremlin insists that the main purpose of the meeting is to ensure cybersecurity in the light of unpredictable actions by the West and to defend the country against possible external actions. However, Russian bloggers and internet experts fear that this may be an attempt to restrict freedom and even isolate Russia from the global network. On Oct.1, the Russian Security Council will discuss issues of internet protection in emergency situations, such as military action or mass protests inside the country. In addition, the possibility of handing over domain administration functions to the state will be considered. Currently, these functions are performed by the public organization Coordination Center for TLD RU. Presidential press secretary Dmitry Peskov said there are no plans to shut the country off from the global internet network. At the same time, he pointed out that "the actions of our partners in the United States and Europe have recently acquired a certain degree of unpredictability and we should be prepared for this", the Interfax news agency quoted him as saying. Peskov went on to add that this was not about isolating Russia from the global network but about "protecting [it] from possible external actions". Are Russians ready to ‘be cut off’? In July this year, the Russian Communications and Mass Media Ministry conducted a drill aimed to test internet resilience in Russia and prevent the possible disruption of service in the event of ‘unfriendly’ action. The outcomes of the drill will form the principal topic for discussion at the upcoming session of the Russian Security Council. According to the ministry, the drill has shown that the Russian segment of the internet is vulnerable, therefore officials are discussing ways of minimizing the risks. "It is common knowledge who the main administrator of the global internet is. Given this unpredictability, we must think of how to ensure our national security," Interfax quoted Peskov as saying. Judging by Peskov's statement, it appears that the Russian government fears an internet shut-down or an outside attack, i.e. a repeat of the Syrian scenario. As a result of an internet blockade in 2012, most services in Syria ended up shut off from the outside world. The country remained incommunicado for two whole days. According to the Renesys research company, four blocks of IP addresses were inaccessible, and 77 channels, making up 92 percent of the country's router network, experienced problems. It is still not known who was behind that attack, although the Syrian government blamed it on "hostile forces in the West." Russian IT experts say that a scenario whereby the Russian internet could be shut down from outside the country is possible but not very probable. "Of course, there is a system of centralized control over allocation of IP addresses and DNS server support and, in theory, its administrators could make changes to root zone files. 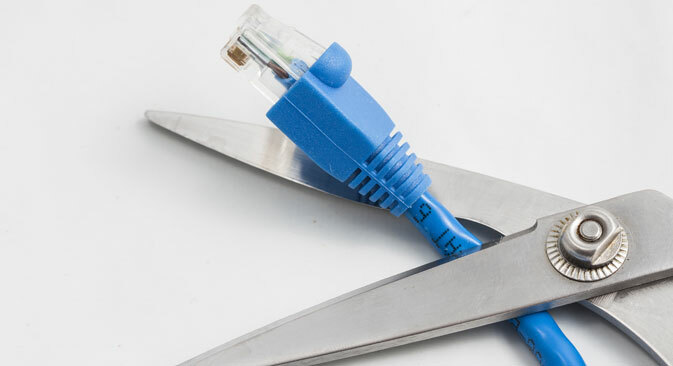 Then links between IP addresses and domain names will be cut. And Russia will lose its connection to the outside world for two weeks,” says PIR Center program director Oleg Demidov. “However, in reality such an eventuality is unlikely since the organizations that run the system are not state-controlled. They are outside politics and any sanctions are irrelevant to them," he continued. Demidov adds that a repetition of the Syrian scenario is also unlikely since in Syria, there was an attack on telecom equipment. "It is simply impossible because of the way the internet has historically evolved. We have back-up capacity," Demidov points out. Red button for social networks? It is another question whether Russia "can shut itself off" and whether Russians are ready for it. "For broad masses it is possible, as successfully demonstrated by China,” says Vadim Chekletsov, head of the Internet of Things research center. “However, more advanced users will be able to find ways of circumventing these restrictions." Chekletsov sees no point in cutting off the Russian segment of the internet from the global network in order to ensure security: "Speaking of the Internet of Things, our defense networks are not connected to the U.S. or European ones." The government's initiative is targeted more against civic activism inside the country, bloggers and market players believe. "Possibly, given the experience of the Arab Spring, the real targets are the social networks originating from abroad, like Facebook and Twitter. In the event of mass unrest, it will be possible to shut down all the resources with just one push of a button," says one of the Russia's top experts on cyber security. In his opinion, such functionality would require an overhaul of the whole infrastructure within Russian borders, which will be difficult and costly. Unless it is done at a high level, connectivity may suffer. For his part, prominent blogger and IT expert Anton Nosik believes that there is no technical problem: "In fact, all trunk lines are owned by operators, which operate on a license from the Communications Ministry. A breach of license terms results in the license being revoked,” Nosik wrote in his blog. “Therefore, any Russian internet provider, having received an instruction from the Communications Ministry to shut down certain channels, will follow it within minutes, just so as not to have its license revoked," he wrote.